Established as a program of the Paul Green Foundation in 2001, the North Carolina Freedom Park was launched as a separate 501(c)(3) in 2004. The vision of the project is to create and strengthen bonds among diverse people, to educate and enhance mutual understanding, and to serve as a model of cooperation, respect and common values. The mission is to build a public art park in the center of the North Carolina's State Capital to tell visitors young and old the story of freedom through the African American experience, and celebrate the struggle for freedom by all people. The Freedom Park will be located on the corners of Wilmington and Lane Streets in Raleigh, North Carolina behind Archives and History/State Library and across the street from the North Carolina Legislative Building in easy access to the thousands of school children who come from all over the State each year in their study of North Carolina history. 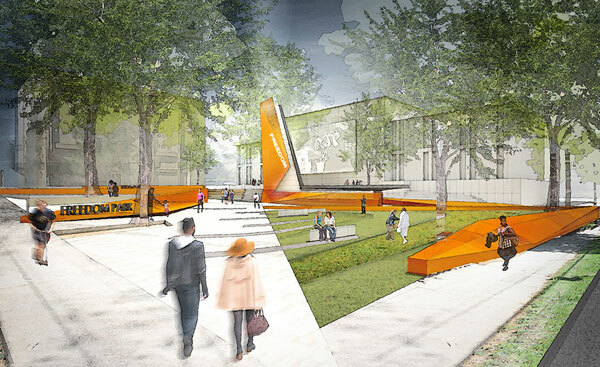 After a national competition the RTP based firm of Perkins+Will headed by renowned architect Phil Freelon has been selected by the North Carolina Freedom Park Board to design the North Carolina Freedom Park, which will be located on State Government grounds at the corner of Lane and Wilmington Streets. The park will honor the African American experience and struggle for Freedom in North Carolina. Work will begin in 2017 and is currently projected to be completed in 2020.